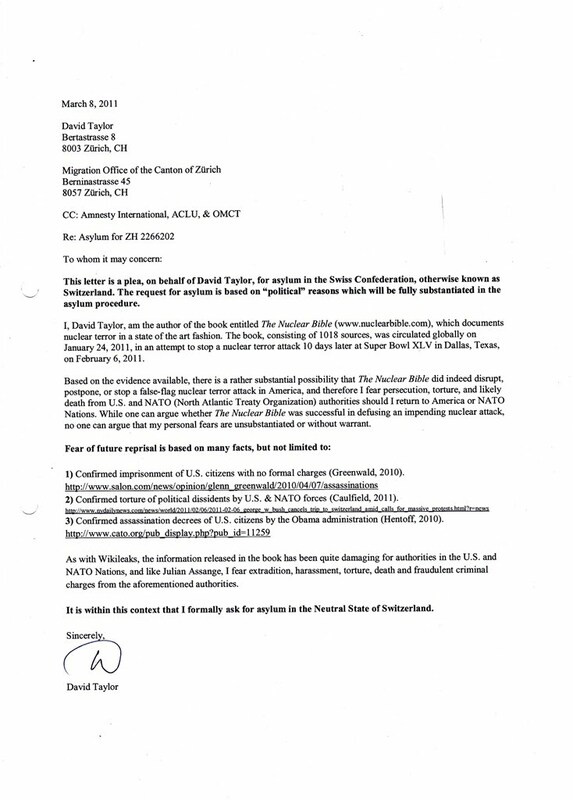 David Chase Taylor sent his first official letter (see below) in regards to political asylum on March 8, 2011, to the Migration Office of the Canton of Zürich via registered Swiss post. The Migration Office of the Canton of Zürich failed to respond to Taylor's letter. Despite repeated attempts by Taylor to communicate with and meet with the Migration Office of the Canton of Zürich via letters, emails and calls, Taylor has been denied due process in his case for political asylum, a clear violation of the Migration Office's legal responsibility under Swiss law. As a holder of an Ausländerausweis "B" Swiss residence permit, Taylor is entitled to the same rights and protections under the Swiss Constitution as a Swiss citizen.